David Dunmore can be considered as one of City’s first home grown heroes. Born in Whitehaven, he moved to York at a very young age. He first caught the eyes of City scouts at Cliftonville, a strong breeding ground for future City stars in the 1940s and 1950s. The former Canon Lee pupil signed professional for City in early 1952 and made his first team debut on the last day of the 1951/2 season. He was a squad player during the following season before establishing himself as a first choice striker in the 1953/4 season. A hat trick against Mansfield in October confirmed his pedigree in a struggling side. An ever present, he celebrated his 20th birthday in February and days later he was transferred to Spurs for £10,500, a club record, having scored 21 goals in 32 games that season. Known for his finesse and grace, he spent 6 years at Spurs, one year with West Ham before joining Leyton Orent, he helped them win promotion to the top flight before returning to City in 1965 for £5,000. He spent 2 more seasons with City, helping us to win promotion in his first season, before moving into non league football. Dunmore made 123 appearances during his two spells with the Minstermen, scoring 41 goals. Many believe the money from his sale in 1954 helped to fund our successful 1955 FA Cup semi final side. He is equally well revered in east London and his 4 years at Leyton Orient. In 2012 to mark his 80th birthday, Alan Chandler, an ambassador for the East London team’s Supporters’ Club, made a 270-mile round trip from his Solihull home yesterday to wish Heworth-based Dunmore many happy returns ahead of his landmark birthday. On that occasion, Chandler and Dunmore recalled many memorable games, recalling the time Dunmore ran Ron Yeats ragged at Anfield game and subsequently Bill Shankly had told his Liverpool side if they stopped Dunmore, they stopped Orient. Who knows what might have happened if Shankly had followed up his interest in Dunmore and made him a Liverpool player. 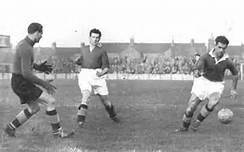 Other products of the 1950s Cliftonville academy included Barry Jackson, who made record 539 appearances for City, Mick Grainger, City’s best ever reserve keeper and winger Charlie Ware. Dunmore worked in a garage as a panel-beater on his retirement from the game but can gain satisfaction from the fact that he is still remembered fondly for his achievements in a Leyton Orient shirt. Having celebrated his 60th wedding anniversary, David and his wife, Barbara, still live in the same house they moved into on their return to York in 1965.